HOWELL, NJ (February 1, 2011) – Gardella Racing announced today that Irish drifting champion and 2009 Formula DRIFT Rookie of the Year, Eric O’Sullivan, will join the Howell NJ-based team for 2011. In an exciting move, O’Sullivan will re-locate to Gardella Racing’s headquarters to become heavily involved as both a team driver and Gardella Racing Ambassador in the Formula DRIFT and grass roots programs. Campaigning the Gardella Racing Pontiac Solstice in the 2011 Formula DRIFT Pro Drift Championship, O’Sullivan will shortly begin an extensive testing program alongside Gardella Racing driver Ryan Tuerck. 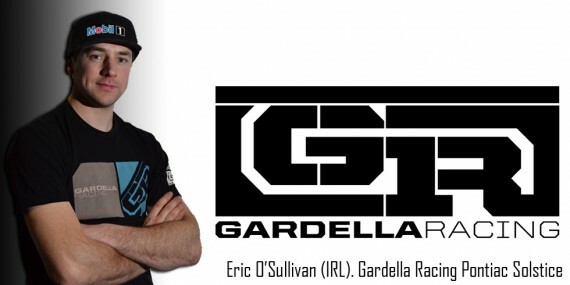 In addition to the 2011 Formula DRIFT Program, O’Sullivan will also enjoy a broader role as Gardella Racing Ambassador reaching out to the grass roots communities of North American Drifting. More details on the extent of O’Sullivan’s role with Gardella Racing will be revealed over the coming months when the Irish driver will travel to New Jersey and be officially introduced to his 2011 team and vehicle. D-UPdrifting.com invited Ryan Tuerck from Gardella Racing up to Monticello Motor Club a few months back for a private test session. This video is a preview of the track and layouts that D-UP Drifting will be running this upcoming season. Enjoy as Ryan describes the track and tears up the Gardella Racing Solstice all over Monticello. COLUMBUS, OHIO (January 27, 2011) – Kenda Tire has signed Formula Drift rookie, Brad Hettinger, as the 2nd driver to compete in the Formula Drift Professional Drifting Series for 2011. Brad, owner of Groundwerks Garage, is no stranger to competition. In 2009 Brad finished in FD Pro AM 5th place qualifier and 13th overall. Hettinger, also qualified 7th in XDC New Jersey, running on Kenda Tires in 2010. Kenda, a leading manufacturer of automobile, bicycle, motorcycle, ATV (All Terrain Vehicle), golf cart, lawn mower, industrial and trailer tires in the world, has maintained its North American headquarters in Columbus, Ohio for the last three decades. Since the inception of the company in 1962, Kenda has operated on core values of honesty, innovation, quality and customer service. For nearly 50 years, Kenda has continued to develop and expand its product selections to meet changing market demands. Visit http://www.kendausa.com for more information.